We acted as General Contractor for the construction of this beach front hotel in Oxnard, CA. This project was the construction of new all-suites rooms in free standing buildings on the existing property of the Westlake Inn in Westlake Village, CA. Other work on the property included construction of a vine covered trellis system throughout the property and renovations to the site restaurant. This wood framed medical plaza in Westlake Village, CA serves the medical profession in the area. 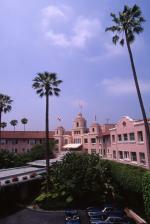 In the late 1980's we completed a major renovation to the Beverly Hills Hotel in Beverly Hills. The work included renovations to the pool and cabanas, the Crystal Ballroom, the individual cottages, the main lobby, lobby tenants and reception area and room corridors. This retail center project near the mission in San Juan Capistrano included retail and restaurant space, a multi-plex movie theater and a 400 car parking structure.